After Niigata-ken Chuetsu-Oki Earthquake happened, some deformations were found at buried parts of circulating water pipes at Kashiwazaki-Kariwa Nuclear Power Plants. We had evaluated the soundness of deformed pipes, and concluded that the degree of deformations is small enough to use these pipes continuously. In this paper, some results of these evaluations are described. For tank, the evaluation method for influence about top board by fluid sloshing is not defined well. We carried out shaking test about cylindrical tank to investigate behavior of inner fluid. And we conducted simulation analyses about the shaking test, too. In this paper, results of the shaking test and simulation analyses, and evaluation for comparison of those are described. Hamaoka Nuclear Power Station Reactor No. 5 was automatically shut down when an earthquake occurred in Suruga Bay on August 11, 2009. A special maintenance plan for inspections to verify the soundness of equipment and facilities in Hamaoka Nuclear Power Station was formulated following the earthquake. The main steam turbine in Hamaoka Nuclear Power Station Reactor No. 5 was inspected based on the plan. The middle standard bearing box, which had the thrust bearing of the turbine was found to lift slightly from the turbine base. Deformation of the fixing bolts and keys of the middle standard bearing box was also observed. The phenomena indicated that the turbine rotor remarkably moved along the axial direction relatively to the stationary blades due to the earthquake. In this paper, the results of the inspections conducted on the turbine in Hamaoka Nuclear Power Station Reactor No. 5, especially repair and restoration of the middle standard bearing box are described. In Hamaoka Power Station, thinning management of piping system is considering earthquake resistance. Current management method is too conservative due to assumption that has large range thinning by liquid droplet impingement erosion (LDI). Therefore, we are developing reasonable earthquake safety evaluation method suited for locally-thinning caused by LDI. To understand the influence on earthquake resistance by the locally-thinning, fixed quantity evaluation was executed based on an actual thinning case. For seismic safety of piping system with local thinning surface by liquid droplet impingement erosion (LDI), hybrid tests were conducted to the piping with locally-thinned elbow. In this presentation, determination method of the thinning shape on the elbow is developed. To determine the thinning shape by LDI, droplet behavior at the elbow is calculated in various flow and piping size conditions, and collision point and velocity for each droplet is evaluated. Then, the relationship between collision conditions and thinning rate is assumed from existing knowledge and thinning shape is determined. The evaluated thinning shape is compared with actual LDI case for the validation of the method, and the method is confirmed. In order to evaluate seismic safety of piping systems with locally wall thinning by LDI, hybrid tests have been conducted incorporating a numerical analysis of whole system with a loading test of elbow model. Seismic performance effects of wall thinning elbow were clarified by comparing three cases of different thickness elbow models such as no defect, 50% thinning and 75% thinning. By these results, the almost same hystereses of the non-linear load displacement relations were obtained and the damages of elbow specimen were not found out by penetrate tests. The static finite element analyses under cyclic loadings were also carried out to consider above results. Fig. 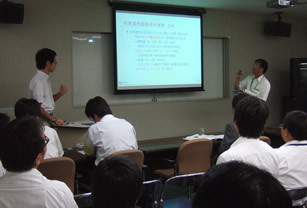 14 A discussion after a presentation on [A-4] "Seismic Safety"
Proceedings of JSM 7th Annual Conference, p.341-p.369, Omaezaki, July 2010 (in Japanese). 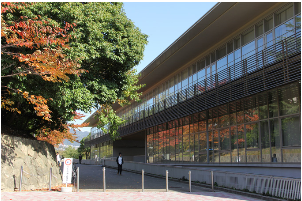 EJAM Japan Column "The JSM 7th Annual Conference at Omaezaki, Shizuoka"